The Trans-Amazonian Highway (official designation BR-230, official name Rodovia Transamazônica), was inaugurated on September 27, 1972. It is 4,000 km long, making it the third longest highway in Brazil. It runs through the Brazilian states of Paraíba, Ceará, Piaui, Maranhão, Tocantins, Pará and Amazonas, from the proximities of Saboeiro up until the town of Lábrea. The highway was intended to integrate these regions with the rest of the country, and with Colombia, Peru and Ecuador. Another main goal of the project was to alleviate the effects of the drought affecting the Northeast region of the country by providing a route to largely empty land in the middle of the rainforest, which could be settled. It was originally planned to be a fully paved highway 5200 kilometers long. However, these plans were modified following its inauguration. In particular, because of high construction costs and Brazil financial crisis in the late 1970s, only a part of the highway was paved, from its beginning to 200 km ahead of Marabá. The lack of a fully sealed road causes many problems. Travel on the non-paved stretches of the highway is extremely difficult during the region's rainy season between October and March. In the wet season cars often get stuck in the poorly constructed road and in the dry season there are often pot holes in the dry mud roads that damage vehicles. Trans-Amazonian highway within the city of Pombal. Construction of the highway was very challenging because of the remoteness of the site. Workers building the road were frequently isolated and without communication. Occasional visits to nearby cities provided the only outside contact. However, severe techniques and procedures that evolved during the construction of Belém-Brasília Highway (BR-153) were then used. 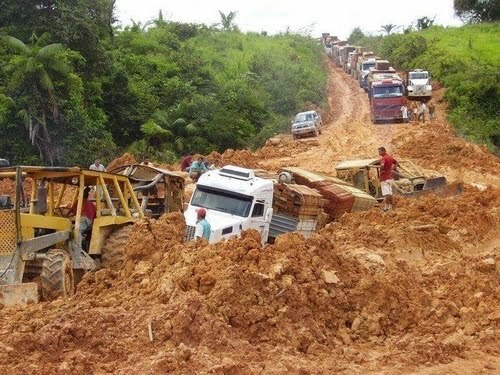 According to DNIT, roughly 800 km of the highway is due to be paved in the next 4 years, improving transport links in the central region of Pará state. The Brazilian Government are now planning to pave with tarmac the whole highway. As of December 2009, paving was underway between the town of Ruropolis and Itaituba and north to Santarém. This will connect soy plantations with overland trucking routes to the south of Brazil. The road has been left untouched however at points further west of Itaituba, at times narrowing to roughly 2 meters wide. Access to the construction sites was mostly accomplished by small airplanes using temporary airstrips and boats. Today construction vehicles can be seen traversing the road east and west bringing dirt and gravel to prepare for paving operations. It has indirectly caused a great deal of deforestation in Brazil - where there are roads it is easier to transport timber. 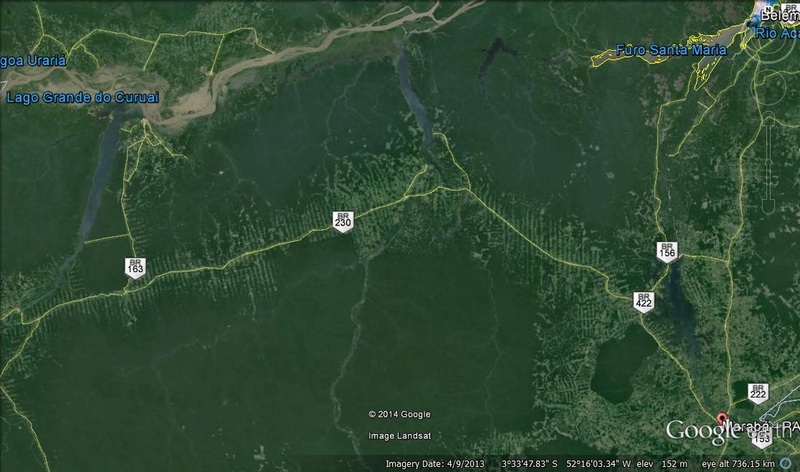 Satellite images demonstrate how roads increase deforestation. Access roads branch perpendicularly off BR-230 allowing deeper penetration into the surrounding jungle areas. Originally these roads were to open up land for agriculture by settlers, the government motto "land without men for men without land" was coined to describe the development of the Amazon. However, loggers have used these roadways to further deforest the surrounding jungle. The Trans-Amazonian Highway has offered an overland route into remote areas of the Amazon. Some adventurers have used this route to traverse the width of the Amazon jungle. Over the history of the Trans-Amazonian Highway one woman and three men have cycled BR-230 including Louise Sutherland of New Zealand. She was the first person to take on this challenge and chronicled her journey in the now out of print book The Impossible Ride. In 2009, American Douglas Gunzelmann successfully traversed the continent utilizing about 1,800 km of the Trans-Amazonian Highway. Note:I have recently read blogs where other touring cyclists have ridden this road. I am only traversing about 1/4 of it. I have read some of Louise Sutherland's book, what I am doing is nothing compared to her exploits, it is a good inspirational read. BR 230 in the wet season.